Citation Information: J Clin Invest. 2006;116(1):80-89. https://doi.org/10.1172/JCI25716. Topoisomerase II (Topo II) inhibitors are cell cycle–specific DNA-damaging agents and often correlate with secondary leukemia with chromosomal translocations involving the mixed-lineage leukemia/myeloid lymphoid leukemia (MLL) gene on chromosome 11 band q23 (11q23). In spite of the clinical importance, the molecular mechanism for this chromosomal translocation has yet to be elucidated. In this study, we employed 2-color FISH and detected intracellular chromosomal translocations induced by etoposide treatment. Cells such as ataxia-telangiectasia mutated–deficient fibroblasts and U2OS cells, in which the early G2/M checkpoint after treatment with low concentrations of etoposide has been lost, executed mitosis with etoposide-induced DNA double-strand breaks, and 2-color FISH signals located on either side of the MLL gene were segregated in the postmitotic G1 phase. Long-term culture of cells that had executed mitosis under etoposide treatment showed frequent structural abnormalities of chromosome 11. These findings provide convincing evidence for Topo II inhibitor–induced 11q23 translocation. Our study also suggests an important role of the early G2/M checkpoint in preventing fixation of chromosomal abnormalities and reveals environmental and genetic risk factors for the development of chromosome 11 translocations, namely, low concentrations of Topo II inhibitors and dysfunctional early G2/M checkpoint control. Broken chromosome ends caused by etoposide treatment are kept adjacent in BV173 cells. (A) Schematic diagram for the location of probes for FISH analysis. 11q23 probes are paired probes flanking centromeric (green) and telomeric (red) termini of the MLL gene. 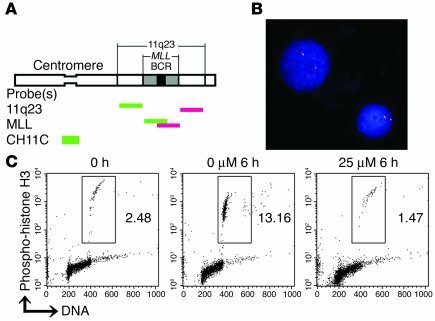 MLL probes are paired probes spanning the MLL gene with minimal overlap in the BCR. CH11C is specific for chromosome 11 centromere. (B) Representative image of BV173 cell line hybridized with the 11q23 probes. Cells were treated with 25 μM etoposide for 6 hours. Original magnification, ×600. (C) The percentages of M phase BV173 cells incubated with 0 or 25 μM of etoposide concomitantly with colcemid for 6 hours. M phase cells were simultaneously stained with anti–phospho-histone H3 antibody and PI and were determined by flow cytometry. Dots representing M phase cells are enclosed within the rectangles.